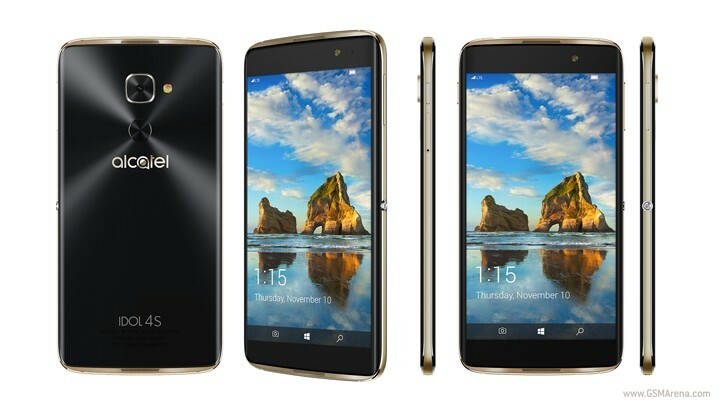 Alcatel has officially announced the company’s flagship model running Windows 10 Mobile after yesterday's early leak. The Alcatel IDOL 4S is already available at T-Mobile, but now the carrier will sell a Windows 10 version of the IDOL 4S. The IDOL 4S supports the included VR headset and is the first windows smartphone to do so. It supports Windows Continuum (the ability to connect the smartphone to a full size keyboard, mouse, and monitor), and Windows Hello (via fingerprint). This Windows 10-powered smartphone is physically identical to two other smartphones, the Android-powered counterpart, as well as the BlackBerry DTEK60. The Windows 10 version of the smartphone has a few differences from the Android version. First off, the company went with a 1080p screen instead of a QHD screen. The decision to do this must have been due to the increase in horsepower, as the Windows version sports a Snapdragon 820 CPU while the Android version clocks a Snapdragon 652 chip. RAM gets a 1GB boost from 3GB but the battery stays the same at 3,000 mAh. More differences can be seen in the camera department, there’s a 21MP rear-facing camera, and an 8MP front-facing camera with LED flash, just like the Android version. There are also dual-firing stereo speakers. The IDOL 4S with Windows 10 will be available at T-Mobile for $469 (about $19.50 /month) starting on November 10 exclusively at T-Mobile. Please please offer this phone as soon as possible in Iran. Windows mobile 10 is becoming more and more popular. And it should be, because it is much better than Android.